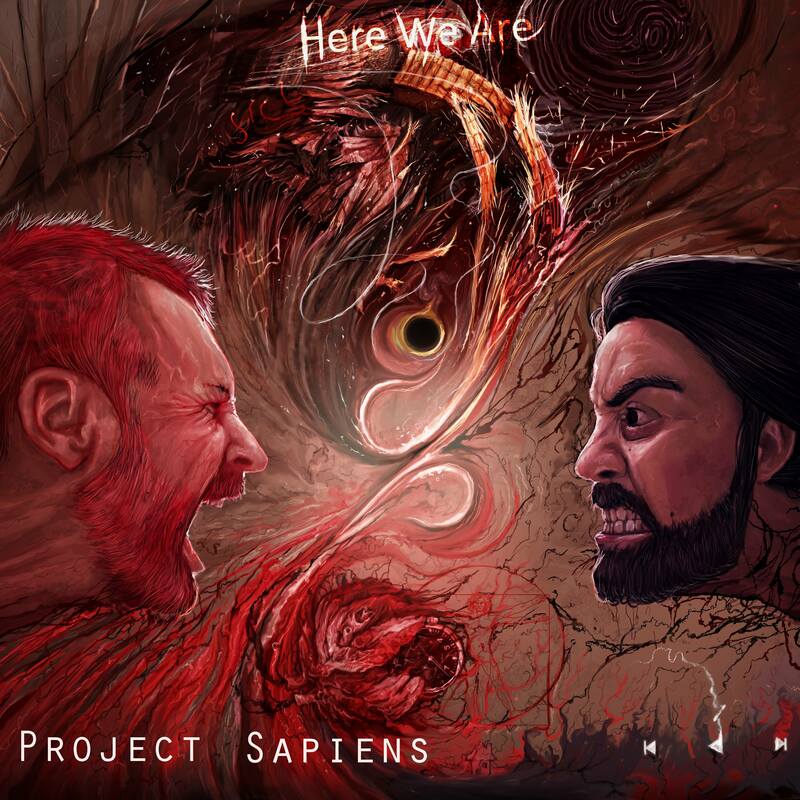 “Copenhagen’s progressive metal duo Project Sapiens assault listeners’ ears with highly energetic and sporadic bursts of brilliant dynamics on debut EP Here We Are,” are the words Prog Sphere’s Darryl Johnson opens his review of Danish prog metal duo Project Sapiens’ debut release. Multi-instrumentalist and composer Poul Jakobsen opens up about the debut release and sheds light on what it took to write the EP, its themes, and more. Define the mission of Project Sapiens. The overarching idea was always to write music about everything that is human – our emotions, fears, reflections on the past events, social change and the future of mankind. Lyrics are a big part of our work and we hope that both, music and lyrics, will speak to those looking for a deeper connection, some inspiration and topics to ponder. Tell me about the creative process that informed your debut EP Here We Are and the themes it captures. I was writing a lot of songs for Project Sapiens that spanned from pop, pop-rock to prog-metal, but shared the same goal – discussing the social change, future of mankind and emotional journey of an individual trying to comprehend the surrounding world. However, the incoherence of the sound and genre forced me to recalibrate and well… I had to choose which direction to go. Here We Are is a metal EP and it’s my first attempt to find my musical identity, both as a guitarist and lyricist. What is the message you are trying to give with Here We Are? As mentioned, this song is rooted in feelings of anxiety and fear caused by the pace of global change. I think we are living in extraordinary times, but the next years might be crucial to the future of mankind. It might very much be the case that we are witnessing the end of an era – end of the post cold-war order, change from the physical to digital forms of expression, total datafication of our lives, shortage of natural resources. Here We Are is narrated by a person who speaks for all of us and reflects on these changes, but also asks questions about the future. It might be that our generation is the one who will find out if what we are seeing is the end, or the beginning of a great new chapter in the history of humankind. Possibilities to prolong our lives (maybe even indefinitely in some digital way), need to redefine such concepts as money, religion, freedom or privacy… it gets quite overwhelming when you start to reflect on these new developments and what do they mean for the future of mankind. That’s what Here We Are is all about. Most of the music was written as a result of improvisation in the open C tuning. Once I got some coherent structure, I recorded a draft on my phone and tried to work my way up. Melodies often come to me already at the guitar draft stage and the riff progression inspires some particular thoughts that I explore further in the process. Yes, I wanted the album to flow in a certain way despite not being a real concept album. You’ve got the opening track (“Here We Are”), which is rooted in anxiety caused by the global change and sets the scene for the rest of the EP. It’s followed by an aggressive “Uprising”, which is a reflection on the tragic events of the Warsaw uprising of 1944 and its’ impact on the Polish nation. “My Prison Cell” is a story of an internal struggle focusing on how an individual fails to deal with self-inflicted pain and self-acceptance. “Anger”, on the other hand, takes a little turn and looks into the outside world through the glasses of a person, who cannot comprehend acts of violence. I wrote this song shortly after the wave of terrorist attacks in Europe, which shattered my sense of security and made me wonder about the root cause of terrorism and the concept of violence… The closing track “Keepers of the Realm” takes the listener from our earthly problems into space. It reflects on the nature and the future of mankind, possibilities for space colonisation, and eternal life. It was a long process mostly because of my lack of experience with recording music. I played in many bands, but it was usually related to playing live gigs. Sitting in front of a computer trying to figure all the technical aspects out, producing your own music, getting involved in the mixing and mastering process – it’s quite an adventure. I changed the gear several times, recorded some of the songs several times due to some technical issues or just being too sloppy to document the setup and sounds. Once I got all the instruments recorded, I wrote melodies and then the lyrics. Since I’m not that much of a singer, I asked my good friend Mads [Rahbaek, vocals] if he’d like to join the project and record the vocals. Luckily, he said yes and we’ve been working together ever since. It was a long process, as the music and vocal parts took us into previously unexplored territories. How long Here We Are was in the making? From the decision to go in the metal/prog-metal direction to getting the EP ready to be released… it took probably around a year. On top of that there are the visuals, which took additional time to coordinate. The main impact on the writing process and the sound was the decision to tune my guitar in the open C tuning, which I first saw on electric guitar when I got to know the music of Devin Townsend. Other than that, it’s hard to say what bands influenced the writing process… As mentioned, it was my first attempt in finding my musical identity, so I guess that there are bits and pieces of all the bands that I listened to over the years. I have quite broad musical interests, from Gojira to Pink Floyd or Chopin. I think it enables creativity and makes it possible for people like me to give their dreams about making music a real shot. If you’re determined enough, you can get a long way without ever leaving apartment. All the amazing plugins, sample libraries and software make it possible to record albums at home and giving big studios run for their money. Here We Are was recorded on a laptop at home without having a real band… twenty years ago it wouldn’t be possible. I hope that it will help people to connect with themselves, inspire to think about the surrounding world and face some of the fears. I guess I’m not the only person pondering issues of global change, having problems with anxiety and self-acceptance… If the music we’re making connects with somebody else out there and helps them through the day, to figure stuff out… it would be really amazing. So that’s where it gets fun. We are currently recording the next album, which is a beginning of a three piece concept story. It’s a tale about a demon, who is tired of his lonely life in hell and decides to come to earth and force humans into loving him, which is supposed to fill the void in his heart. He’s got an evil companion and a pretty messed up plan how to conquer the earth… I hope that we will be ready with the first out of three albums in the first quarter of 2019. The release date is dependent on the funding as the entire album will be released as an animated cartoon. Three albums, three animated episodes, hopefully one each year. All depends on the time and support we get, but these upcoming albums are so much fun that it would be a dream come true to get them released. And yes, it’s going to be heavy, epic and prog, but not necessarily in a conventional way. You can think of it as an album and a cartoon for adults who enjoy head-banging to metal and don’t mind having few laughs while doing so. And I forgot to mention, it’s a musical… You can follow the progress on the new album on our facebook page where we often stream from studio, so stay tuned. Here We Are is out now and is available to order from Bandcamp.